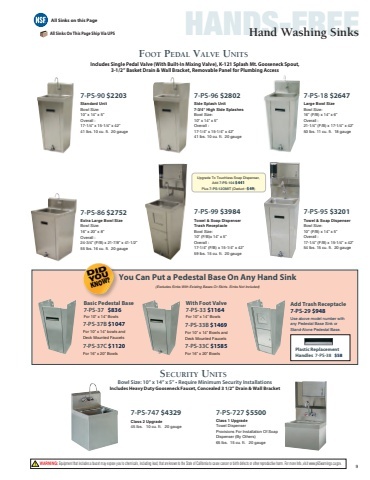 All Sinks on this Page HANDS-FREE All Sinks On This Page Ship Via UPS Hand Washing Sinks  FOOT pEdAL vALvE uNiTS Includes Single Pedal Valve (With Built-In Mixing Valve), K-121 Splash Mt. Gooseneck Spout, 3-1/2” Basket Drain & Wall Bracket, Removable Panel for Plumbing Access    7-PS-90 $1559 Standard Unit Bowl Size: 10” x 14” x 5” Overall : 17-1/4” x 15-1/4” x 42” 41 lbs. 10 cu. ft. 20 gauge 7-PS-96 $1984 Side Splash Unit 7-3/4" High Side Splashes Bowl Size: 10” x 14” x 5” Overall : 17-1/4” x 15-1/4” x 42” 41 lbs. 10 cu. ft. 20 gauge 7-PS-99 $2821 Towel & Soap Dispenser Trash Receptacle Bowl Size: 10” (F/B)x 14” x 5” Overall : 17-1/4” (F/B) x 15-1/4” x 42” 59 lbs. 15 cu. ft. 20 gauge 7-PS-18 $1719 Large Bowl Size Bowl Size: 16” (F/B) x 14” x 6” Overall : 21-1/4” (F/B) x 17-1/4” x 42” 50 lbs. 11 cu. ft. 18 gauge    7-PS-86 $1949 Extra Large Bowl Size Bowl Size: 16” x 20” x 8” Overall : 24-3/4” (F/B) x 21-7/8” x 41-1/2” 55 lbs. 16 cu. ft. 20 gauge 7-PS-95 $2266 Towel & Soap Dispenser Bowl Size: 10” (F/B) x 14” x 5” Overall : 17-1/4” (F/B) x 15-1/4” x 42” 54 lbs. 15 cu. ft. 20 gauge    You Can Put a Pedestal Base On Any Hand Sink (Excludes Sinks With Existing Bases Or Skirts. Sinks Not Included) With Foot Valve 7-PS-33 $756 For 10” x 14” Bowls 7-PS-33B $954 For 10” x 14” Bowls and Deck Mounted Faucets 7-PS-33C $1030 For 16” x 20” Bowls SECuRiTy uNiTS    Basic Pedestal Base 7-PS-37 $543 For 10” x 14” Bowls 7-PS-37B $680 For 10” x 14” bowls and Deck Mounted Faucets 7-PS-37C $728 For 16” x 20” Bowls Add Trash Receptacle 7-PS-29 $616 Use above model number with any Pedestal Base Sink or Stand-Alone Pedestal Base. Bowl Size: 10” x 14” x 5” • Require Minimum Security Installations Includes Heavy Duty Gooseneck Faucet, Concealed 3 1/2” Drain & Wall Bracket Plastic Replacement Handles 7-PS-38 $37   7-PS-747 $3064 Class 2 Upgrade 45 lbs. 10 cu. ft. 20 gauge 7-PS-727 $3893 Class 1 Upgrade Towel Dispenser Provisions For Installation Of Soap Dispenser (By Others) 65 lbs. 15 cu. ft. 20 gauge   WARNING: Equipment that includes a faucet may expose you to chemicals, including lead, that are known to the State of California to cause cancer or birth defects or other reproductive harm. For more Info.,visit www.p65warnings.ca.gov. 9  DID YOU KNOW? WARNING: Faucets on this page may expose you to chemicals, including lead, that are known to the State of California to cause cancer or birth defects or other reproductive harm. For more Info.,visit www.p65warnings.ca.gov.